Summer is almost here, which means outdoor toys are a must. Whether kids are trying to cool off in the backyard or headed to the beach for a day of sun and sand, Prime Time Toys and American Plastic Toys have all the essentials. 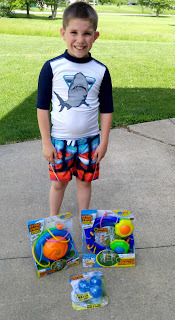 Check out these hot new toys for backyard play from Prime Time Play! 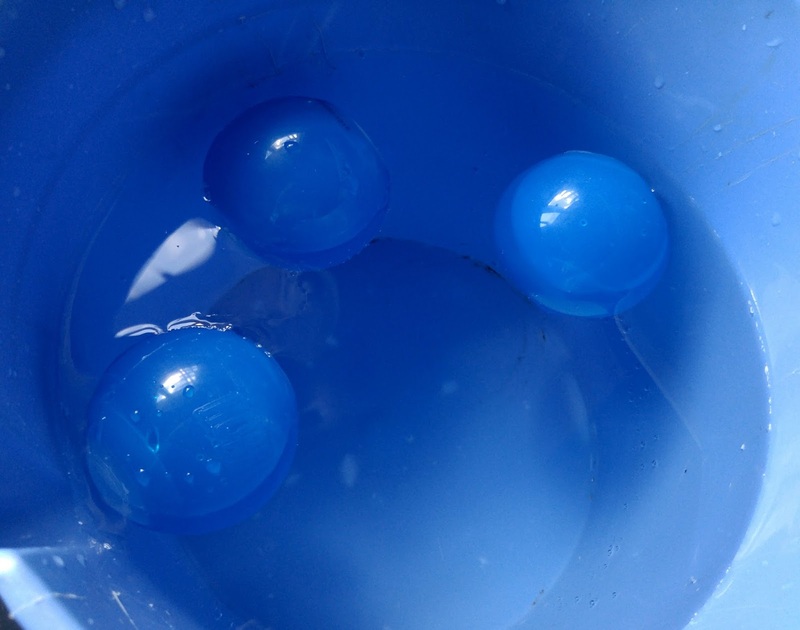 With Hurricane Reusable Water Balls, simply dip soft shelled balls into water to fill and splash, then reuse over and over again. With one quick, light squeeze, these durable balls will fill and seal themselves. Splash Away with the New Hurricane Reusable Water Balls. These Balls are SELF SEALING! No waiting! 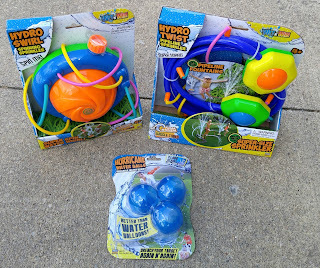 No fumbling with tiny water balloon knots! Hurricane Balls fill and seal with a quick squeeze. Fill em up and drench your friends right away! With a Durable Soft Shell, Hurricane Balls are Reusable AGAIN and AGAIN! Up to 1,000 Splashes! These are fun and easy to use for kids and adults alike! Simply dunk the reusable ball into the water for a few seconds and it will self-seal once full. Throw the ball and it instantly splashes on contact. No mess to clean up, just grab the ball and start over again. Kids had fun throwing these and even hit mom a few times! 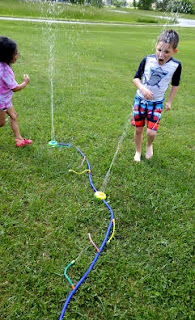 Hydro Twist Pipeline Sprinkler & Hydro Swirl Spinning Sprinkler - With the Hydro Twist Pipeline Sprinkler, kids can enjoy a day of super-sized play as they run around this two fountain, 8 foot pipeline of sprinkler. The sprinkler blasts water into the air as six tidal storm wiggle tubes spray in all different directions. For a new kind of twist on sprinkler fun, the Hydro Spinning Sprinkler features a hydro powered spinning dome for children to experience splashing from every direction. The Hydro Twist Pipeline Sprinkler is the supersized sprinkler that stretches out the splashing fun for a yard full of play! The 8 foot pipeline stretches across the ground shooting water in many different directions. The Hydro Twist features two fountains blasting more water into the sky and six tidal storm wiggle tubes. Gather all the kids in the neighborhood for this outdoor excitement. The Hydro Twist Pipeline Sprinkler has a pipeline that spouts and blasts water from two fountains and multiple Tidal Force wiggle tubes. All you have to do is connect it to a standard garden hose and have the fun begin. Seriously the neighbor kids all came around for this as it was nice and long and they all could run ad play through it! A new twist on classic sprinkler fun, Hydro Swirl Spinning Sprinkler brings a new dimension to backyard water play with its Super Spin Water Whirl! The Hydro Swirl features a hydro powered spinning dome on top, with six tidal storm wiggle tubes on the edge. These tubes wiggle and splash in all directions for an amusing splash and a cool spray on a hot summer day! 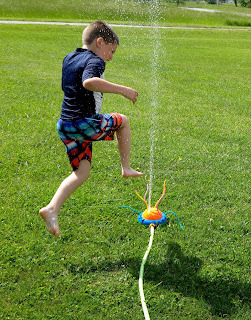 The Hydro Swirl Spinning Sprinkler has whirling, twirling from six Tidal Storm® wiggle tubes spin swirling geysers of water high and wide for kids to dodge, dance around, and run through. My son and daughter had a blast running and jumping through it! You can purchase all these on Amazon! Hurricane Reusable Water Balls (3-Pack / Colors Vary) $11.99 & FREE Shipping on orders over $49. Hydro Twist Pipeline Sprinkler - $34.90 & FREE Shipping on orders over $49.